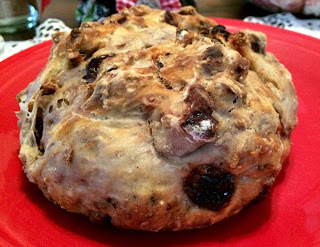 I thought for President's Day, we'd share some of this Crusty Cherry Walnut Bread by the fire. My friend, Debbie, over at Mountain Breaths recently shared this recipe here. It looked so fabulous, and since I love making bread, I wanted to try it. The original version is with dried cranberries, but I love Montmorency dried cherries, and since it's President's Day, that's what I'm using. Debbie got the recipe from a friend, as that's how recipes go, right? I'm using my favorite cherry teacup, which was a gift from a dear blogging friend, and having some Black Forest tea that another sweet friend sent me awhile back, but I wanted to save for a special occasion. The tea mat and the teabag holder were gifted to me from another dear blogging friend. Aren't they perfect for my cherry tea? This is the reverse side of my tea cozy that Bernideen made. She said that she didn't intend to make her cozies reversible, but isn't it pretty? Just look at this warm bread right from the oven!! My son tasted it and asked, "Is that what you had sitting in the plastic container, on the counter last night?" It's so wonderfully chewy, and delightfully tasty. I hope you make some soon. Keep one and give one away to make someone happy. This is one of those wow factor breads, that's embarrassingly easy, but oh so tasty! 6 quart or higher dutch oven or 2 smaller dutch ovens, if making small loaves, or any large oven-safe pot with a lid. Stir the first 6 ingredients together in a large bowl. Stir in the warm water. The dough will be pretty sticky-- you want a sticky dough! Gently shape into a ball as best you can. Cover tightly with plastic wrap or aluminum foil. Set on the counter at room temperature, and allow to rise for 12-18 hours. The dough will double in size, stick to the sides of the bowl, and be covered in air bubbles. Turn the dough out onto a lightly floured work surface and, using lightly floured hands, shape into a ball as best you can. Transfer dough to a large piece of parchment paper. (Large enough to fit inside your pot and one that is safe under such high heat. Using a very sharp knife, gently score an X into the top. Cover dough lightly with plastic wrap and leave alone for 30 minutes. During this 30 minutes, preheat the oven to 475 degrees. Place your dutch oven (with the lid) or heavy duty pot inside for 30 minutes so that it's extremely hot before the dough is placed inside. After 30 minutes, remove the dutch oven from the oven and carefully place the dough inside by lifting it up with the parchment paper and sticking it all-- the parchment paper included-- inside the pot. Cover with the lid. Must say that it makes me want to try it! 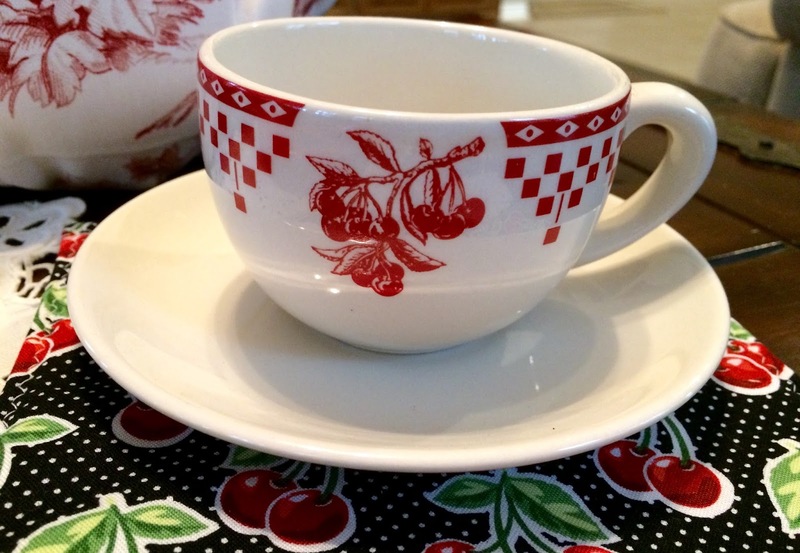 I'm loving your cherry-themed tea time, especially the items from blogging friends. 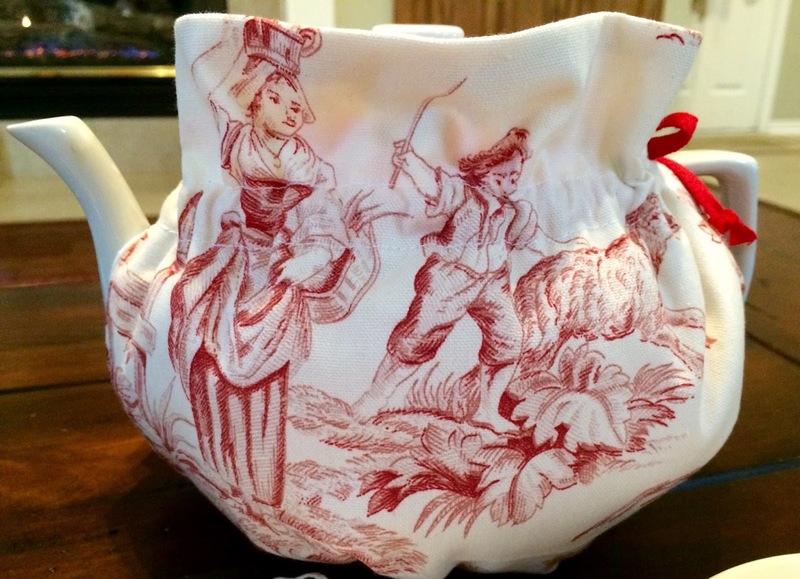 The reversible tea cozy is fabulous! I also like to save the unique teas gifted to me (like the Eggnogg'n Tea) for special occasions. I wished that I had stocked up on the Black Forest Tea as I haven't seen them in months. Hi Kitty? What a wonderful President’s Day post. I love bread but can’t knead with hand problems so this looks wonderful! Saving the recipe and trying this indeed! So the recipe will be making another home visit! Have a lovely week and thanks for linking to Tuesday Cuppa Tea. 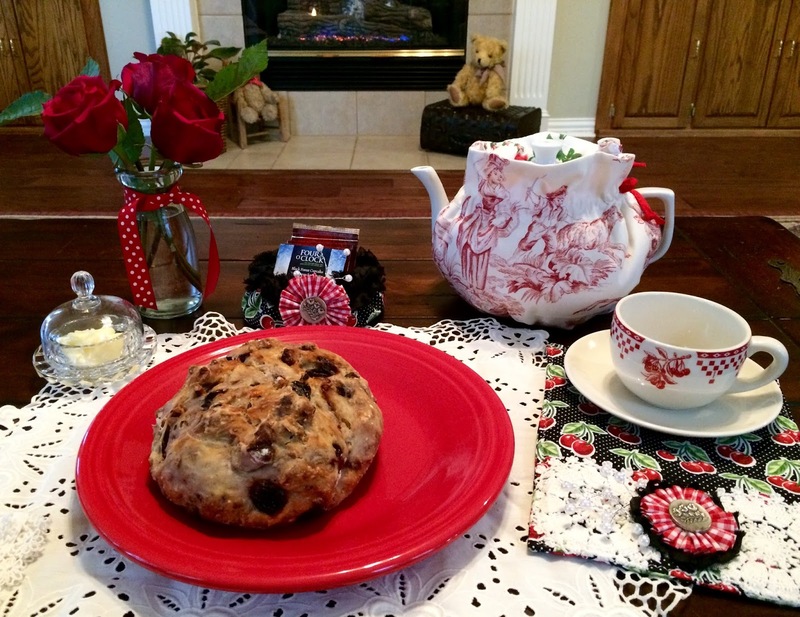 Your table looks so pretty in red!Love the placemats and the teacup,cheerful!The Tea cozy is romantic and beautiful,and I also love the crocheted doily.Your bread looks delicious...Hugs! Kitty, I love homemade bread but I haven't made it in years. Like Ruth, it's hard on my body to knead bread. The cherries sound simply wonderful and I bet makes a fabulous bread. Love the cherry teacup. I also save my special teas for special occasions; like the Eggnoggin tea. So many lovely teas are not available here in Canada. Have a beautiful day, my friend. Homemade bread is delicious. I can almost smell all that goodness from down here. Such a pretty teacup. Love all the pops of red on your table. Bernideen's cozies are beautiful; love the print on the inside of your one. Kitty, that is President's Day perfection! I think I'd like the cherries over the cranberries too, but either sounds great. Your cup, mat, cozy - I love them all. I was drooling over Bernideen's cozies. They are so well made! I saved her shop as a favorite so I can easily go back to it. Thank you! Have a great week! Oh your President's Day celebration is delightful Kitty. Your bread sounds so good, warm and crusty, yum. Love the pretty teacup and the cozy is so sweet. Hope you have a wonderful week....Hugs. Sounds amazing!! The walnuts are what would make it most delicious to me! I can eat a whole bag of walnuts all by themselves! LOL! Thanks for sharing. :) Praying for you. Very pretty setting, Kitty! I've made lots of 'no-kneed' breads but never with walnuts & cherries...I shall try this very soon. All your pretty pinks & reds look lovely together. I especially love your cherry cup. I have some of that cherry fabric in my stash, too!! Love it! Your bread looks absolutely wonderful and how you styled your table is perfect for President's Day. Great theme and special to use meaningful gifted items. The bread looks ever so tasty and I bet it's perfect with a cup of tea. Okay so this is RIGHT up my alley!! Especially since I'm on a yeast bread kick! Now I wonder, do you think frozen cherries would make this too 'soupy'? I have a bunch that I froze last summer. Maybe if I thaw them, drain and dry them up a bit? I may give it a try -- this looks SO good and I LOVE the cherry cup and the cozy as I am a big fan of red! Oh my...another yummy recipe. I think I want to eat some right now! Thanks for sharing and have a blessed week! Dear Kitty: What a delicious bread. I can imagine the way the house smelled while it was baking! I am surprised to see the reverse (lining) looking that well on the cozy - that is so funny! Your cherry table theme looks darling and who doesn't love cherries!! Thanks for sharing. Your table setting is so nice accented with the red and the bread looks so good. 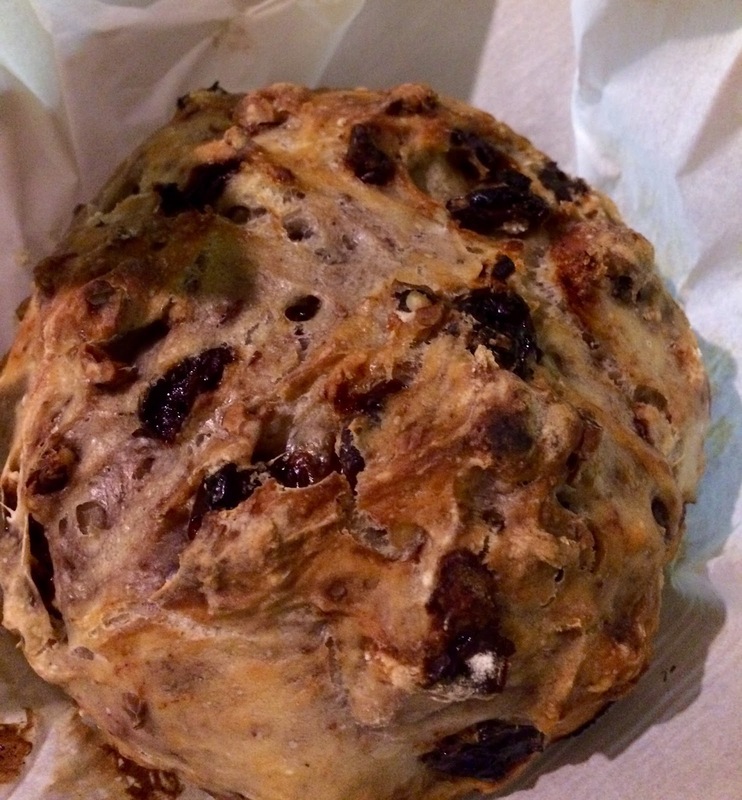 Thanks Kitty for sharing this bread recipe at our Cooking and Crafting with J & J. Sounds divine Kitty, and how cute to feature cherries for President's Day! I never make bread, but no knead sounds right up my alley, yum!! Oh my this looks SO good Kitty. Where does one buy Montmorency cherries? This looks delicious, Kitty. And how nice when the dishes match the flavor of the food. Kitty, mmm ... I love the no-knead bread, and with the addition of the nuts and dried Montmorency cherries, well ... heaven! Love the whole cherry thing you've got going on! How much rain have you'al had? We have had over 6 inches so far, mercy me! I would just love a nice slice of your delicious Crusty Cherry Walnut Bread, it looks so good! Your post is awesome and thanks so much for sharing it with us at Full Plate Thursday. Have a great week and come back to see us real soon!